Raw protein (milk, eggs, fish, sushi, meat) may be contaminated with bacteria and are therefore ideal breeding grounds, especially with a nice (10°C, room) temperature and adequate moisture. Also for parasites and worms. Therefore, they are not recommended for pregnant women and weak (very young or old, or sick) people. Take care of undercooked meat (barbecue, saignant) and raw preparations like steak tartare (or prepare). Steak tartare is chopped or ground raw beef mixed with egg, spices and sauces) or carpaccio, chorizo ​​and salami. Drying or smoking meat kills not the toxoplasmosis parasite (dangerous to an unborn baby). Which can also be injured by contact with the feces of cats, or through unwashed raw vegetables. Also a listeria infection is for a healthy adult usually harmless, but can be harmful to a baby. Except in (vacuum packed) fish and meat it can occur in raw milk and some French cheese "au lait cru". 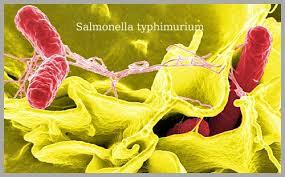 Other pathogenic bacteria are Salmonella, Escherichia coli ESBL (through chicken) and MRSA (by pigs). Raw meat may be contaminated with bullous larvae of tapeworms. Of the 32 species of tapeworms are the beef tapeworm and pork tapeworm harmful to our health. Most infections with pork tapeworm occur in the tropics and subtropics. The beef tapeworm is also found here. You can prevent infection by heating to a temperature above 56°C or by the meat through freezing at a temperature of at least minus 10°C for at least ten days. Infection is usually noticed only by the presence of fifteen to twenty millimeters long and about five millimeters wide, yellowish- white segments of tapeworms in the stool. Only by hygiene and sufficient heating of risky food one can disable these invisible little sick makers.